Farming in cities and small spaces is becoming increasingly popular, but it has its challenges. City Farming addresses the problems the urban farmer might face and turns them into creative solutions. It assists the new grower to gain expert understanding of how to create a production urban farm, as well as helping established farmers to troubleshoot and discover new ways to bring their space into greater harmony and production. The content is organised by themes of importance to urban farmers - sun and heat, water usage, seasonal production, spatial planning, soil quality and usage, propagation and breeding, pests and diseases, farming under time constraints, sustainability and community initiatives. Urban Composting Made Easy: The Art & Science of Creating "Gardeners Gold"
Composting is a vital component of growing healthy food. Magic occurs in the garden when the caretaker ceases to focus o the plants, and begins to tend to soil. If the soil is robust, the plants will be too. Urban Composting Made Easy shows you how to partner with nature, creating the optimal mix of ingredients and conditions to make compost. 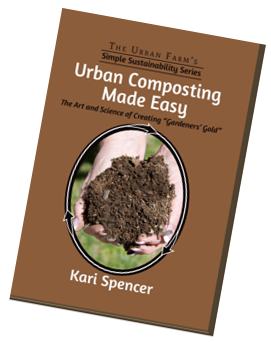 This engaging and well researched how-to guide is written by a real gardener who shares the amazing benefits & real-world process of composting, plus how to in-corporate it into your own gardening practice. Grow your own organic fruits, vegetables, greens and herbs, in your yard or patio. Nourish your family with healthy, affordable produce, even if you have very little time to spare. Start growing food TODAY without any backbreaking work...and experience long-term success. Grow a Food Garden Now! Why wait? Kari Spencer from The Micro Farm and Greg Peterson of The Urban Farm will share their extensive experience and knowledge of growing food. They are passionate about teaching you how to grow fruits, veggies, herbs and greens for your family. Can you imagine picking those fresh bell peppers with your children, and then making them into dinner? How about a homegrown lettuce, cucumber, and strawberry salad for lunch? Now more than ever we need to take control of our food and seeds, in order to safeguard our health and the health of our communities. The best place to start is with the garden in your own backyard. Imagine your garden as a fine wine getting better and better with age. With the Seed School Online system, each year you can have more tomatoes, spicier arugula, and crispier cucumbers to share with friends and family. You will learn to look for the strongest and best tasting plants in your garden. You can choose seeds for amazing taste, insect and disease resistance, or drought tolerance…the sky’s the limit when choosing seeds from plants that performed outrageously well in your garden.